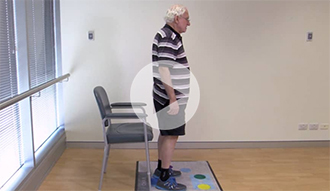 This exercise aims to improve your strength, coordination and balance. It involves standing up from a chair and then sitting back down again. 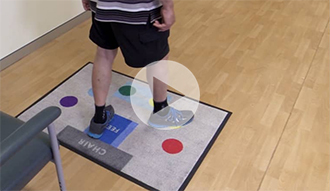 This exercise aims to improve your single leg balance. It involves tapping your foot on the coloured circles of the TASK floormat. 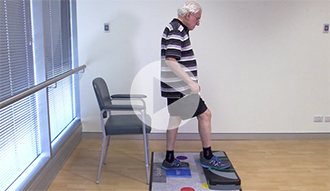 This exercise aims to improve your single leg balance. It involves ‘tapping’ your foot on a step whilst balancing with your other leg. 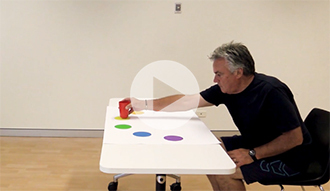 This exercise aims to improve your balance while sitting and reaching for objects on a table. 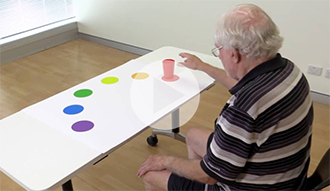 This involves reaching towards a cup and moving it to different coloured circle on the TASK placemat. 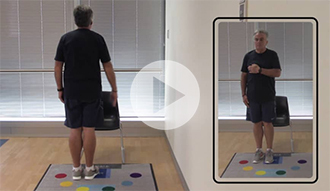 This exercise aims to improve your standing balance. It involves reaching towards a wall in multiple directions.